The described feature is available in the Webix Pro edition. Besides simple subrows it's also possible to render subviews in a datatable. 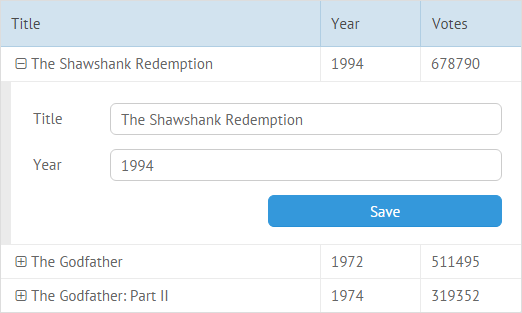 Below you can see the details on how to insert a sub-grid or a sub-form into Datatable. If necessary, any Webix component can be used as a subview. 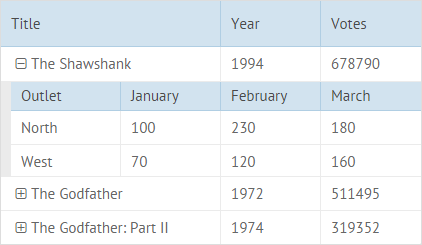 To add a subview into Datatable, use the subview property. In the case of datatable, you should specify a Datatable configuration with all the necessary parameters as value of this property. use the load or parse methods to populate the subgrid with "item-related" data. item - the item for which a subgrid is created. To load data from an external source, use the load method that takes the path to the necessary file or script that will return data for a subgrid. The same as with a Sub-Grid, you can add a Sub-Form into Datatable. You need to initialize a form view inside of the subview property and define the configuration of form elements. Note that the name attributes of the form fields should coincide with data item properties to ensure a simple and clear way of two-way binding. item - the item for which a subview is created. And in the event handler use the setValues method with the item object as a parameter. The form.getMasterView() returns the master datatable view for the subview (form). The received object of the master datatable is used to update data in the datatable after changes made via the subform. When the subform is no longer needed, the master.closeSub() command closes it. If you have not checked yet, be sure to visit site of our main product Webix mvc library and page of datatable html product.